The Victorian Web, or the Dicken's Web as it was previously known, is a hypertext collection of essays on British Literature, history and culture during the age of Victoria (1837-1901). While the site focuses on the Victorian period, there is some relevant material both prior to and after this period which are also included. For example, the Industrial Revolution began before the period but is still included as it gives some background information for the Industrial Revolution which occurred in the nineteenth century. Furthermore, the Victorian Web is not just about Britain, it also includes comparative material from outside of the United Kingdom such as iron in Agriculture and technological advances in other parts of the world such as Austria, Australia, the Czech Republic, France, Germany, Hong Kong, Hungary, India, Italy, Malaysia, Nigeria, Portugal, Vietnam, and the United States. The Victorian Web was initially created as a resource for students in Victorian Literature classes at Brown University by students and staff under the direction of Dr. George Landow. At the beginning it was only staff and students at Brown University who helped develop this resource. 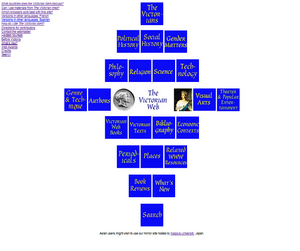 As the site expanded and moved to a more accessible platform, the popularity of the Victorian Web grew. Many people not associated with Brown University began contributing their work and the site became more of a scholarly resource available to many scholars. Due to the popularity of the site it is open to anyone with an interest in the Victorian period. In October 2009, George Landow began laying the framework for the French and Spanish versions of the site. At the moment only a few topics are translated in French and only the main page in Spanish, but it is an ongoing project envisioned to be complete in three years. The Victorian Web was created as an internet resource for students studying Victorian Literature at Brown University. George P. Landow, a Professor of English at Brown University designed and edited the initial site using Intermedia, a hypertext authoring and reading environment no longer available. Under Landow, David Cody wrote general materials and digitized images. Glenn Everett, also under Landow, wrote basic documents on Romantic and Victorian poets and timelines. Kathryn Stockton helped the project by creating documents on feminism and literary theory. The first contributor to the Victorian Web outside Brown University was Anthony S. Wohl, a professor at Vassar College. He contributed documents on Victorian public health, race and class issues, and anti-Catholic prejudice in the Victorian period. In 1992 the Victorian Web underwent a change as all the documents were transferred into Storyspace since Intermedia ceased to be accessible. The next year David Stevenson rearranged all the documents into approximately their current forms. He built and linked all works’ overviews and created a sitemap. In 1994 students in Landow’s Victorian literature class were able to create new documents for the web which were later added to the storyspace. 1995 saw another major change to the project as Marc Zbyszynski began manually recreating in HTML all link menus that storyspace generates automatically so that the Victorian Web could be moved to the World Wide Web. In the same year, Landow created the icons and designed the layout of the HTML version of the site. It was not until the turn of the century that the Victorian Web saw major funding. In 2001 the University Scholars Programme and the National University of Singapore sponsored the Victorian Web’s two servers, one in the United States and the other in Singapore until 2008. The University Scholars Programme also funded scholars in 2001 to work on the books section and the documents on science, technology, and political and social history. The Victorian Web was first created using Intermedia, an advanced hypertext system, created by the Institute for Research in Information and Scholarship (IRIS). The IRIS was established to explore new uses of computing technology in research, teaching, and learning. IRIS wanted to create new ways for people to create, retrieve and organize information. However, IRIS only lasted from 1983 to 1994. Intermedia was an object-orientated program that ran on a Unix based system. Multiple users could access the same document while someone was editing it. One of Intermedia's important features was the Web View, an advanced navigation tool which reduces the chance of getting lost. The Victorian Web then got transferred to Storyspace when Intermedia ceased to be supported. Storyspace is a hypertext writing environment used for creating large, complex, and challenging hypertexts. While other hypertexts emphasize visual presentation, Storyspace emphasizes writing, linking and organization. This page was last modified on 21 October 2010, at 08:14. This page has been accessed 4,869 times.